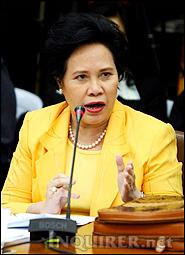 Good job to Senator Miriam Defensor-Santiago! In a bill she filed in the Senate, the fiery senator included bloggers and other online journalists be protected along with the traditional media practitioners. Defensor-Santiago pointed in her Senate Bill 455 which will amend Article 248 of the Revised Penal Code that bloggers and online journalists are likewise exposed to dangers of publishing sensitive political commentaries. The bill is also including other media practitioners such as photojournalists, novelists, screenwriters, playwrights, feature filmmakers, documentary makers, television production, professional photographers and videographers, and public relations contractors. Such a great move from Senator Miriam. At least, our officials do care for our safety despite the very disappointing justice system and security measures we have.